[map] [street view] Between Lakeview Drive and Lindberg St, just north of US 90 in Crestview. Co-located with WJSB. [Studio] Google Street view of station's studio and the WJSB AM tower. 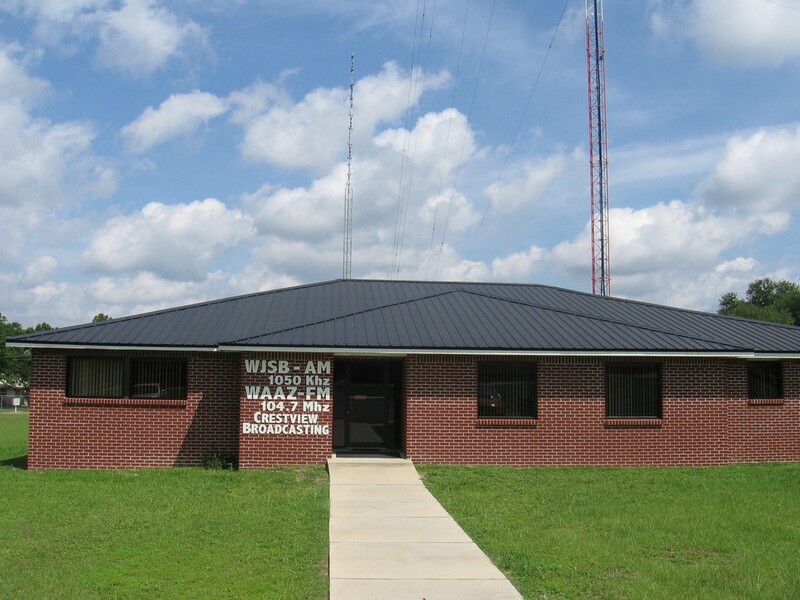 [Picture] Picture of the WAAZ/WJSB studio building in Crestview, from the waazsports.com website (source). 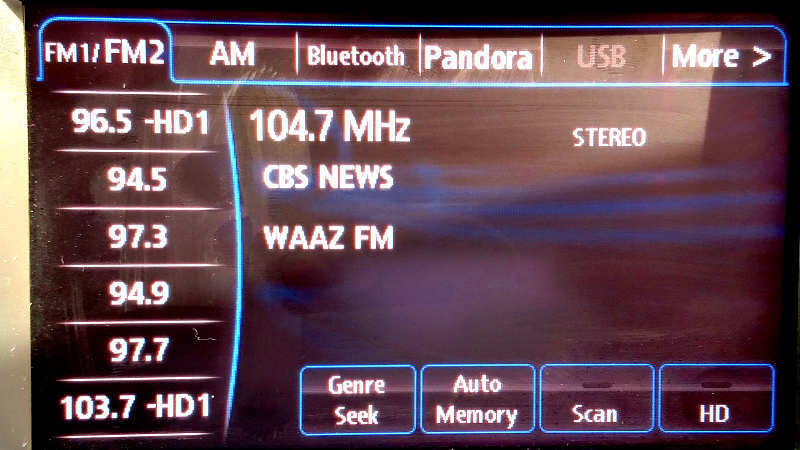 [Picture] Image of the RDS text display from a Mazda sedan's radio, showing the PS (station name), PTY (format, which was missing for this station at the time) and Radio Text fields. This station dates back to November of 1965, when Everett M. McCrary (as Crestview Broadcasting Company) put the station on the air as a class A on 104.9 MHz. It was spawned from AM WJSB in Crestview. The FM originally broadcast from the studios at the corner of West 1st Avenue and Lakeview Drive in town, on the AM tower and used a Gates FMS-1C transmitter paired with a Gates FMA-4A antenna. In 1976 the FCC issued a Report and Order authorizing the station to move to 96.5 MHz, but that option was never built out. Instead, the station filed to move to 104.7 in 1989, with a boost in power to 50 kW. That facility went on the air (still from the WJSB AM tower in town) in the early 90's. By 2003, they'd boosted the power again to a full 100 kW. The station has always been country, and simulcast the AM to some degree or another. It also aired the Panhandle Opry in the 80's. It's also always been a CBS News affiliate. Despite the big signal, the station has always been content to be a local station for Crestview and has not sought fame and fortune in larger markets like Pensacola or Fort Walton Beach. AM sister station WJSB has always been a daytimer. After the AM signs off, the FM keeps operating until midnight, when it signs off for the evening. Despite the big signal and large coverage area, the station broadcast in glorious mono until some time in the late 2000's, when a stereo exciter was finally installed at the transmitter. Unfortunately, the music fed to the new stereo generator was still in mono until at least 2015, when they finally — finally — began broadcasting in true stereo.